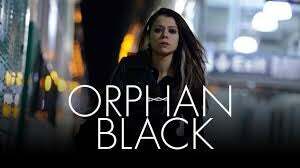 If you haven't seen Orphan Black yet, catch up now! Orphan Black's next season starts in April, and you can catch a sneak peek over at io9 right now (there are also a few other short clips on the BBC America website). First clip from the new season of Orphan Black! For anyone who hasn't seen this show, I highly recommend it. The writing is tight, the pacing is excellent, and the way that one actor can portray so many different characters so well is great to watch. It's great to see a woman not only carrying a sci-fi show by herself, but getting (rightfully) so much respect doing it. Tatiana Maslany is amazing in this. The second season will also deal with a group of women fighting for ownership of their bodies, which is a theme familiar to many feminists. I am sure they'll be replaying it at least once on BBC America (for those of you in Canada, it is co-produced with Space so they'll probably have it on as well) before the next season starts. I probably sound like a shill for the show, but I seriously just love it so much. Definitely my favorite debut of last year. Pretty much the only reason I even watched Doctor Who last year was because it was on right before this.